The Science of the Seasons - Seasons are caused because of the Earth's changing relationship to the Sun. What Causes the Seasons? - It's all about Earth's tilt!. What Causes the Seasons? - The seasons are caused by the tilt of the Earth's rotational axis away or toward the sun as it travels through its year-long path around the sun. 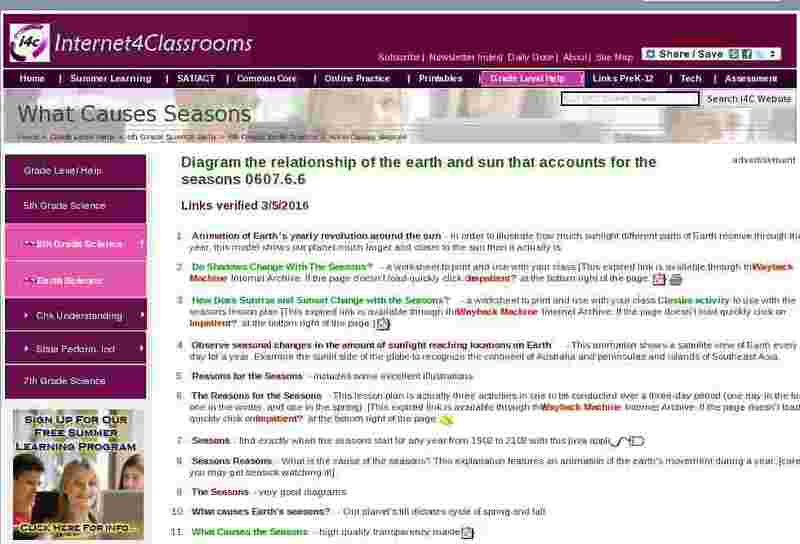 What Causes the Seasons? - [2:16] A movie to explain the cause of the seasons. The movie provides pupils with a clear visualization of the cause of the seasons and they can be encouraged afterwards to describe them to one-another. What Causes Seasons on Earth? - Seasons happen because Earth's axis is tilted at an angle of about 23.4 degrees and different parts of Earth receive more solar energy than others. Why Earth Has Four Seasons - Earth has seasons because our planet’s axis of rotation is tilted at an angle of 23.5 degrees relative to our orbital plane.